Fantastic opportunity for user or investor to repurpose this former factory. Layout allows for multi-tenant / users or one large user/tenant. Building consists of manufacturing and warehouse areas, machine shops, offices, labs, testing space and much more. Corning is located in the southern tier of New York State bordering Pennsylvania in Steuben County. Just above the city the Cohocton and Tioga rivers merge to form the Chemung River that runs through downtown. In addition to the river, Corning’s setting consists of beautiful, steep hills and is a gateway into the Finger Lakes Region of central New York. The rich history and culture Corning offers is nourished by the Corning Museum of Glass, Historic Market Street and the abundance of arts and entertainment including the Orchestra of the Southern Finger Lakes, Rockwell Museum of Western Art and True Tales Tours featuring humorously narrated true local stories. American Style magazine has named the city one of the top twenty-five small city art destinations in the country several times, much of which is attributed to the landmarks in the downtown area known as the Gaffer District. Just a short drive from Corning is Watkins Glen, home to Watkins Glen International, which celebrates over 60 years of Road Racing and hosts one of New York’s largest wine festivals. Wine lovers can also visit various wine trails, cellars and vineyards in the area. The neighboring city of Elmira is located in Chemung County within 200 miles of major northeastern cities including New York City, Pittsburgh and Toronto. The scenic area has more than twenty parks, many veteran memorials and the recently restored Eldridge Park Carousel, which spins at nearly 18 miles per hour making it the fastest carousel in the world. Elmira also has a strong support for the arts with an arena and several theaters and performing arts centers in the area including First Arena, the Clemens Center and Elmira College Gibson Theatre. Mark Twain summered in Elmira for over 20 years and wrote many of his literary classics here. Visitors from all over the world visit his study at Elmira College and his final resting place at the Woodlawn National Cemetery and leave a cigar in his honor. Elmira College is a coeducational private liberal arts college. The college is noted as the oldest college still in existence which granted degrees to women that were equivalent of those given to men. Chemung County’s economy is strongly based on manufacturing based on its easy access to highways, air and rail service, telecommunications networks and a diverse work force. Local manufacturers receive the cost benefits of Elmira’s strategic location because of the close proximity to national and international shipping ports. Corning Incorporated, a Fortune 500 company, is a leader in the glass industry and supplies nearly 65% of the glass to much of the electronics market. Alstom – the global specialist in energy and transportation infrastructure, The Gunlocke Company, Dresser Rand, Mercury Aircraft Incorporated, Panelogic Incorporated, Upstate Niagara, Storflex Fixtures Corporation and the Corning Hospital, make up the majority of employment in the area. Elmira based manufacturers produce a wide array of goods that are shipped globally. Companies include the Hilliard Corporation, Eaton, Kennedy Valve, Eastern Metal, Emhart, Synthes USA, Demet’s Candy Co, F.M Howell Company, CAF, Vulcraft, Anchor Glass (Ardaugh Group) and Hardinge Incorporated. 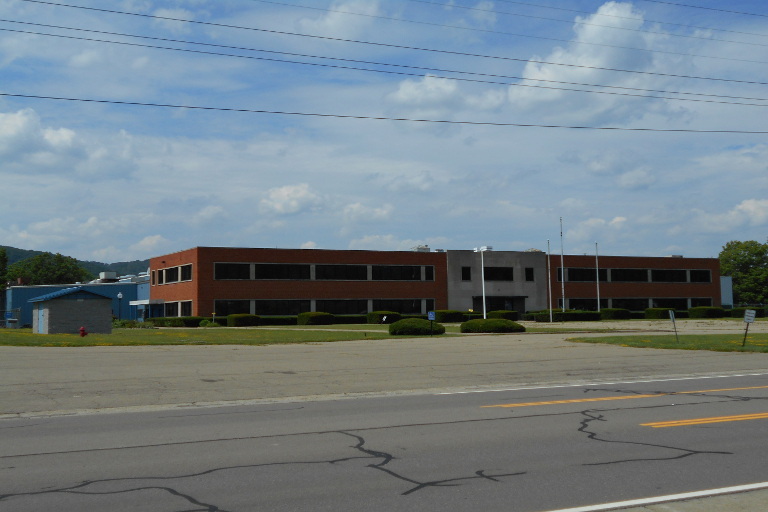 CVS also has a large presence in Chemung County with a 751,000sf distribution center. The interstate system plays a vital role in the success of the Elmira Corning area with I-86 connecting to the East to I-81 and I-88 and to the West to I–390 and I–99. (Route 15) The proximity of the area to PA has resulted in numerous gas/gas related companies locating to the area to service the gas exploration currently in PA. Schlumberger, McJunkin Redman, HOST Sand Terminal, Air-Flo Manufacturing, and Gas Field Specialists are just a few of many companies that are here. The Elmira Corning Regional Airport has three couriers with direct flights to Detroit, Tampa/St Petersburg, Sanford /Orlando and Newark, NJ. Elmira – “Soaring Capital of the World.” In 2014 celebrated 150th Birthday.